Sorry to keep you waiting fish folks! Had a busy morning doing health checks for one client yesterday (20 fish for skin/gill biopsies and blood samples for KHV = 4 hours of fishy fun!). This week, in honor of last Saturday’s surgery, we are tackling one of the fancy goldfish members, the oranda! If you have ever been in a pet store, you have seen the oranda. 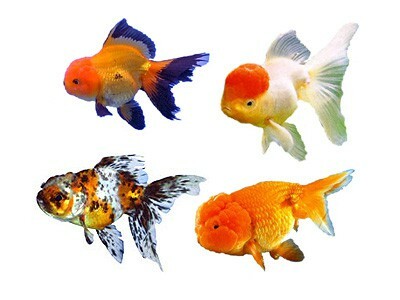 Basically, take a normal goldfish, add a giant jelly-bubble helmet and presto, an oranda. This bubble mass around its head is called a wen. 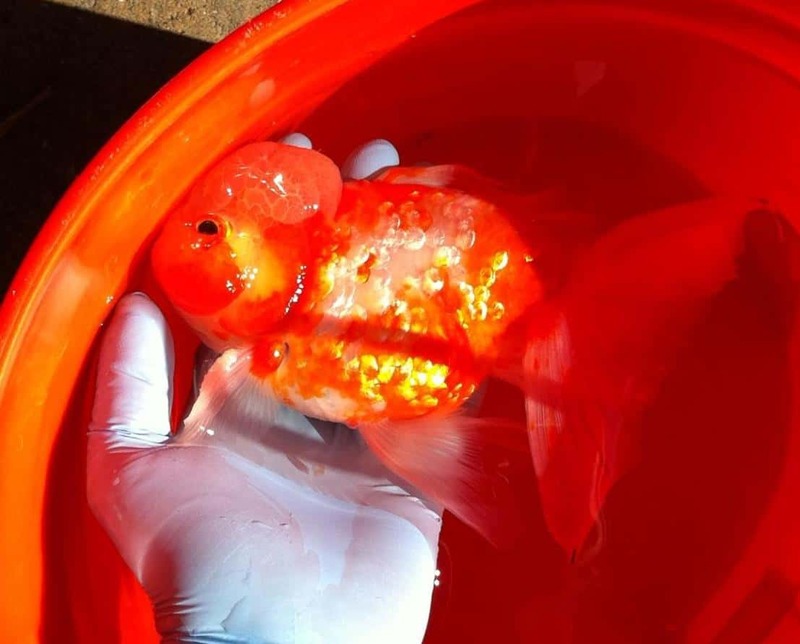 Originally a genetic mutation, the wen has been breed into this particular group of goldfish. The wen may grow just on their heads, or over their cheeks as well. The wen will keep growing as the goldfish grows, and sometimes can outgrow its fish’s frame. This results in fish laying with their heads down on the bottom or unable to see. What to do about that? Why, take him for a fish “haircut!” That’s exactly what we did last Saturday. Here is Sputnik. You can see his wen over his head and cheeks. It’s even covering part of his eyes! Our patient, Sputnik, had a month history of lying on the bottom of his pond with his head down. We took him for x-rays at Westside Animal Clinic in Santa Cruz, CA, in order to check for signs of polycystic kidney disease (PKD). PKD can cause problems with a fish’s buoyancy, and is, unfortunately, fatal. The x-rays were inconclusive, so his owners and I decided to wait and see if he could turn things around himself. A month later, no real changes were seen, so we decided to take some of the bulk of his wen off and see if he could get back to normal. Sputnik’s surgery went very wel! It turns out the his wen was also starting to grow over the bottom portion of his eyes, making it hard to see. Our fantastic tech, Connie, assisted in keeping Sputnik asleep during the surgery. After the surgery, Sputnik was able to swim around normally! It will take him a few days to get the hang of swimming around without the added weight on his head. A few different variaties of orandas. There are more! As far as pets go, orandas are a great choice! Goldfish, of any variety, tend to be a little more hardy of the fish species. Oranda’s can be tricky. Their long, flowing fins can be torn if there is abrasive substrate or decor in their tank. And obviously, you will most likely need to get their wen trimmed back once or twice during their lives. They come in a wide variety of head sizes and colors. Check them out at your local fish store today!